Anedjib, more correctly Adjib and also known as Hor-Anedjib, Hor-Adjib and Enezib, is the Horus name of an early Egyptian king who ruled during the 1st dynasty. The Egyptian historian Manetho named him "Miebîdós" and credited him with a reign of 26 years, whilst the Royal Canon of Turin credited him with an implausible reign of 74 years. Egyptologists and historians now consider both records to be exaggerations and generally credit Adjib with a reign of 8–10 years. Adjib is well attested in archaeological records. His name appears in inscriptions on vessels made of schist, alabaster, breccia and marble. His name is also preserved on ivory tags and earthen jar seals. Objects bearing Adjib's name and titles come from Abydos and Sakkara. Adjib's family has only partially been investigated. His parents are unknown, but it is thought that his predecessor, king Den, may have been his father. Adjib was possibly married to a woman named Betrest. On the Palermo Stone she is described as the mother of Adjib's successor, king Semerkhet. Definite evidence for that view has not yet been found. It would be expected that Adjib had sons and daughters, but their names have not been preserved in the historical record. A candidate for being a possible member of his family line is Semerkhet. According to archaeological records, Adjib introduced a new royal title which he thought to use as some kind of complement to the Nisut-Bity-title: the Nebuy-title, written with the doubled sign of a falcon on a short standard. It means "The two lords" and refers to the divine state patrons Horus and Seth. It also symbolically points to Lower- and Upper Egypt. Adjib is thought to have legitimised his role as Egyptian king with the use of this title. Clay seal impressions record the foundation of the new royal fortress Hor nebw-khet ("Horus, the gold of the divine community") and the royal residence Hor seba-khet ("Horus, the star of the divine community"). Stone vessel inscriptions show that during Adjib's reign an unusually large number of cult statues were made for the king. At least six objects show the depicting of standing statues representing the king with his royal insignia. Stone vessel inscriptions record that Adjib commemorated a first and even a second Hebsed (a throne jubilee), a feast that was celebrated the first time after 30 years of a king's reign, after which it was repeated every third or fourth year. But recent investigations suggest that every object showing the Hebsed and Adjib's name together were removed from king Den's tomb. It would seem that Adjib had simply erased and replaced Den's name with his own. This is seen by egyptologists and historians as evidence that Adjib never celebrated a Hebsed and thus his reign was relatively short. Egyptologists such as Nicolas Grimal and Wolfgang Helck assume that Adjib, as Den's son and rightful heir to the throne, may have been quite old when he ascended the Egyptian throne. Helck additionally points to an unusual feature; All Hebsed pictures of Adjib show the notation Qesen ("calamity") written on the stairways of the Hebsed pavilion. Possibly the end of Adjib's reign was a violent one. Adjib's burial site was excavated at Abydos and is known as "Tomb X". It measures 16.4 x 9.0 metres and is the smallest of all royal tombs in this area. Adjib's tomb has its entrance at the eastern side and a staircase leads down inside. The burial chamber is surrounded by 64 subsidiary tombs and simply divided by a cut-off wall into two rooms. Until the end of the 1st dynasty, it would seem to have been a tradition that the family and court of the king committed suicide (or were killed) and were then buried alongside the ruler in his necropolis. Stone vessel fragment bearing Anedjib serekh. Serekh of Anedjib from an inscription. Map of Anedjib's tomb in the Umm el-Qa'ab. ^ a b c Wolfgang Helck: Untersuchungen zur Thinitenzeit. (Ägyptologische Abhandlungen, Volume 45), Harrassowitz, Wiesbaden 1987, ISBN 3-447-02677-4, page 124, 160 - 162 & 212 - 214. ^ a b Toby A. H. Wilkinson: Early Dynastic Egypt. Routledge, London 1999, ISBN 0-415-18633-1, page 78, 79 & 275. ^ a b Iorwerth Eiddon Stephen Edwards: Early History of the Middle East (The Cambridge Ancient History; Vol. 1, Pt. 2). Cambridge University Press, Cambridge 2006, ISBN 0-521-07791-5, page 27–31. ^ a b Nicolas-Christophe Grimal: A History of Ancient Egypt. Wiley-Blackwell, London/New York 1994, ISBN 0-631-19396-0, page 53 & 54. ^ Stan Hendrickx, Barbara Adams & K. M. Cialowicz: Egypt at its origins: studies in memory of Barbara Adams - proceedings of the international conference "Origin of the State, Predynastic and Early Dynastic Egypt. Peeters Publishers, Leuven 2004, ISBN 90-429-1469-6, page 1137. ^ Jean Daniel Degreef: The Heb Set Festival, Sequence and pBrooklyn 47.218.50, in: Göttinger Miscellen, vol. 223 (2009); ISSN 0344-385X, page 27-34. ^ Günter Dreyer: Zur Rekonstruktion der Oberbauten der Königsgräber der 1. 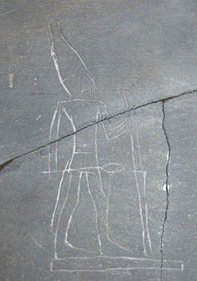 Dynastie in Abydos (Mitteilungen des Deutschen Archäologischen Instituts Kairo 47). von Zabern, Mainz 1991, page 56. ^ Walter Bryan Emery: Ägypten, Geschichte und Kultur der Frühzeit, 3200-2800 v. Chr. Fourier, Wiesbaden 1964, ISBN 0-415-18633-1, page 17. This page was last edited on 19 November 2018, at 09:59 (UTC).